This is SD (Standard Definition) for quicker playback. For those with faster broadband speeds, as option click HD gray letters to turn on HD and also, the 4 arrows icon if you wish to view full screen. The first 90 seconds of Gardens of Miranda make use of techniques and processes that will continue to be used in the serial's production. Model set elements like the rock tower and the trees are married with CG painted backgrounds and skies. Stop-motion animated props and characters are recorded against a blue backing, to eventually be combined using post-production software like Nuke and After Effects, into completed scenes. 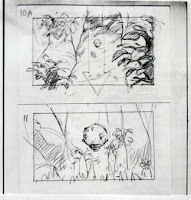 The general idea was to match what I shot with what I drew in the story-boards as closely as possible. For many live-action films the story boards are often considered just a spring-board to explore variations on a basic idea and so are often redrawn several times. However, because this is an animated project, I spent a lot of time thinking about camera angles and how to tell this story as effectively, and, in terms of shot numbers, as economically as possible, so I attempted to follow my story boards almost to the letter. 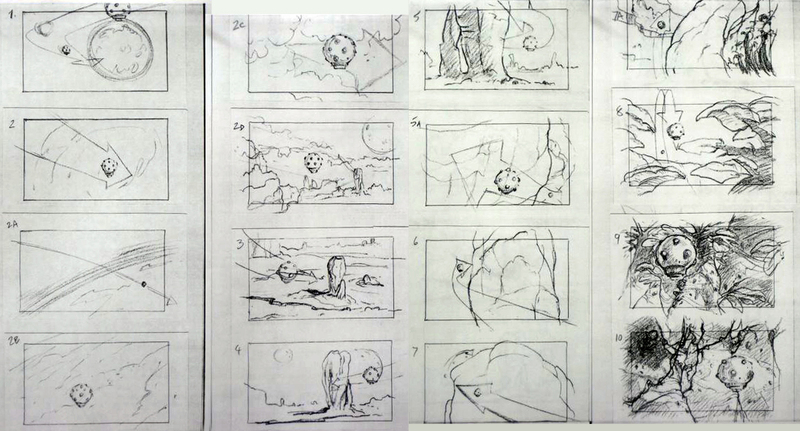 To illustrate what I mean, here are the boards for this opening sequence. As you can see, I tried to stay as faithful to the compositions and camera angles as I could. Now, I don't want to infer that this all done solo. I collaborated with some very talented people who did excellent work in handling the post-production duties. Leon Kogan and Susan Nelson composited the many visual elements, labor that involved frame-by-frame removal of support rigs, blue-spill cleanup, color correction, stabilization, motion-blurring and a slew of other visual enhancements. Some were quite minor, but no less important in making the shots look convincing within the parameters of Miranda's alien environment. The original music and sound effects were all created by Gregory Bossert, using Motu's Digital Performer software. He did his usual great job, just as he did in 2007 when we collaborated on Skull Island, a proof-of-concept test loosely based on scenes from the 1933 classic film, King Kong. If you'd like to see Skull Island, it's posted on Youtube, or for both color and B&W versions you can go to my site at www.menagerieproductions.com and click on the Animation heading. The remaining shots for GoM are progressing very nicely, so remember to check in regularly to see what's new. And click here to see how you can help! P.S. I am using Vimeo for first time to post this sample teaser. Also, my Vimeo channel not set-up yet. I realize uploading to video hosting sites can affect quality due to compression, internet speed, etc.. The teaser clip default is at Standard Definition (SD) .You also have option to play in High Definition (HD). I would be curious to know how it plays/looks on your computers. I think it's looking great! I'm really loving the model work! A great combination of stop mo/miniatures/CGI. Can't wait to see more! Here has so alternative posting about. I like this article for the importance of it as I want to share BBEX is an advisory company, based in California, working on Website Design and Online Marketing for unique companies. We offer well-built websites and brilliant marketing alternatives via web visibility and more guests. SEO Motivated is a Marketing south florida allows you to make your online business.